In 1923 de Maistre was awarded the Society of Artists Travelling Scholarship, receiving an annual stipend of £250 for two years study in Europe. Moving between London and Paris, as well as travelling further afield, de Maistre’s paintings from these years reveal a young artist absorbing and learning from what he saw, experimenting with various styles and techniques to develop his own personal language.2 He exhibited at the Paris Salon in 1924 and showed work in the 1926 Venice Biennale, his paintings showing the marked influence of modern British art with his subjects depicted in a realistic if stylised manner. 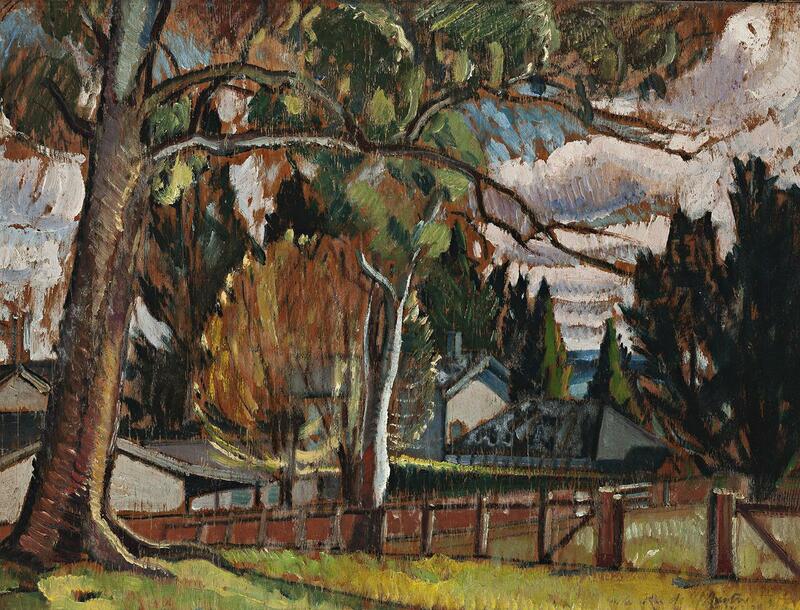 Sutton Forest, a small town near Moss Vale in the Southern Highlands of New South Wales was the subject of some of the paintings exhibited at Macquarie Galleries. Having spent his childhood in the area, de Maistre was familiar with the local landscape that is distinguished by its extensive plantings of introduced trees and temperate climate. A short distance from Bowral where James Fairfax lived at Retford Park, it is a landscape that he would have also known well. In this 1927 depiction of Sutton Forest de Maistre uses muted tones to describe a picturesque rural scene of houses and outbuildings framed on the left by a large tree in the foreground and offering a glimpse of low blue hills in the distance. The application of paint is lively and the clearly visible brushstrokes give the painting a sense of freshness and immediacy, suggesting that it may have been painted on one of the outdoor painting excursions to the area that de Maistre often took during these years.